Home > Autism Apparel > Youth Blue Autism Awareness Shirt-"Support, Educatate, Advocate"
Youth t-shirts. 100% preshrunk cotton. T-shirts by Gilden. Great quality. 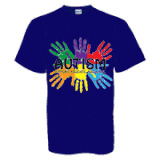 Shirts says: Support, Educate, Advocate.